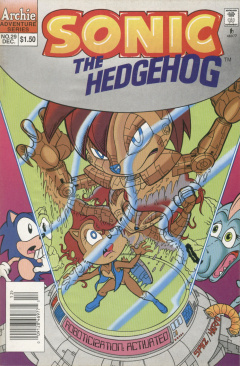 Sonic the Hedgehog 29 is the twenty-ninth issue of the Sonic the Hedgehog comic. This comic features only two stories: Steel-Belted Sally and Growing Pains, Part 2. The story begins with a short review about how dragons used to roam Mobius, until Robotnik roboticized all of them, including Sabina. Sabina's daughter, Dulcy, was able to escape. Dulcy, now grown-up, has joined the Freedom Fighters in their quest to rid the planet of Robotnik's dictatorship. It then cuts to a scene of a SWATbot hovercraft in hot pursuit of Sonic and Dulcy. Dulcy does a quick dive, causing the ship to crash into a cliff. They land beside the wreckage, as Sonic wants to check it for anything salvagable. He begins to search the ship, finding an odd machine near the destroyed SWATbot pilot. Meanwhile, in Robotropolis in his lair, Robotnik complains about the absence of the craft. Snively says it has crashed, leading to Robotnik getting upset as that craft was carrying a de-roboticizer. He orders the self-destruction the craft to prevent it from falling into the wrong hands, but he is too late as Sonic exits the craft just before it explodes. He and Dulcy depart the area to return to Knothole with their new-found technology. Back in Knothole, Rotor has finished analyzing the device and has concluded that the machine is, indeed, a de-roboticizer. Unfortunately, the machine will only work once. Sally votes to use the machine on Bunnie Rabbot. On the other hand, Bunnie, herself, suggests using it to turn one of them into a robot, causing Antoine to believe she's a spy from Robotnik. He tries to restrain her, but Sally realizes what Bunnie means. So much so to the point that she says that she should be the one to go. A few days later, on the outskirts of Robotropolis, the Freedom Fighters group up to prepare to send Sally into the city. Rotor puts a device behind Sally's ear that should let her keep her free-will after being roboticized. After saying good-bye to the Freedom Fighters, Sally purposely runs in front of a group of SWATbots nearby. She evades the laser fire from the bots, in an attempt to make her capture look legit. She calls out for help and trips over a rock. This slow down gives the SWATbots the time to surround her and take her into custody. The others watch helplessly as Sally is hauled off, screaming for help. Sonic finishes distracting the SWATbots with his supre speed and rushes back down so he can surprise the others by reaching Knothole before them, but returns to the secret entrance to see the Freedom Fighters at gunpoint with a roboticizer by Sally, and Robotnik and Snively standing to the side. To prevent any mess-ups, Robotnik destroys the neuro-overrider in front of Sonic. 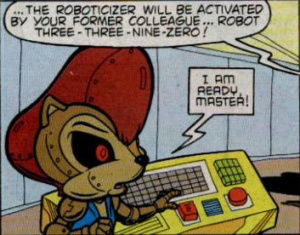 Snively then says the only reason they have not roboticized the others is because they want the de-roboticizer back. Sonic refuses, joking that he "traded it in for a picture of Robuttnik... never know when I'll have to blow my nose!" Snively chuckles at first, but orders the group hauled off for roboticization. While being led away, Sonic quietly asks Rotor where they hid the de-roboticizer, and he says back in Knothole, to which Sonic remembers Dulcy has it. Meanwhile, Dulcy flies around Robotropolis, worried because the Freedom Fighters are late getting back and by the lack of activity in the area. When peaking in a window of the main building, she's horrified to see all of the Freedom Fighters about to be roboticized, placed in individual tubes and unable to escape. Robotnik has decided to forget about retrieving the de-roboticizer due to his imminent success, as he has Robot 3390 ready to press the button to activate the roboticizer. Robot 3390 readies the roboticizer. With the de-roboticizer in hand, Dulcy bursts through the window. Robotnik shouts an order to his minion to quickly Roboticize them before it's too late. In a last-ditch effort, Sonic tries to get through to Sally, briefly causing a conflict of orders in the robot's programming. It ultimately decides to obey Robotnik, reaching forward to press the "Roboticize" button, just as Dulcy engages the de-roboticizer. Her attempt works and Sally is returned to normal. With his plans foiled, Robotnik tries activating the roboticizer himself, knocking a dazed Sally out of the way. Dulcy take a deep breath and engulfs the console in a flame, melting it before he can activate it. Dulcy then turns her attention to Robotnik and Snively, blowing fire at them, causing them to run from the area. With the two gone, Sally goes over to the roboticization tubes and frees everybody. Back in Knothole, despite celebration, Sally is disappointed that she couldn't get the job done, but Sonic tries to cheer her up, as Robotnik couldn't get his job done. Dulcy then chimes in that "That's why I fired him!" After a recap of Tails using the Sea Fox, then getting caught in a trap set up by Robotnik using a robotic fox called Fiona, we come to Tails in the process of being roboticized in an inescapable chamber. Tails shrieks as the machine is activated, but Robotnik is suddenly surprised as the shrieks from Tails and the roboticizer's engine stop. He bends down to look at what could be wrong. The roboticizer blows up in his face, and Tails jumps out revealing that he clogged the machine filters with the fur from his tails, causing it to explode. Just as Tails is about to beat up Robotnik, Fiona slugs Tails straight in the face with a wooden club. Robotnik exclaims that the automation is programmed to defend him to the death, as Tails lies injured and surprised on the ground. Fiona tries smacking Tails with her club, Tails jumps out of the way - only to be caught by one of Robotniks robotic palmtrees that starts to squeeze on him. Everything on the island is automated. When Robotnik thinks he has him, Tails uproots the plant using his tails for lift, then bashes Robotnik with it once he's free, sending him rolling down the sand and into the water. As Tails proclaims the evil Robotnik has done, Fiona pounces on him and sends them tumbling in a cloud of smoke down into the sea. Fiona has no problem beating up Tails, but he is still too infatuated to defend himself. With the battle raging, Robotnik decides to escape. Tails attempts to swim for his Sea Fox, but Fiona begins dunking his head under the water, while he tries to convince her she still loves him. By the third drowning attempt, the water rusts her joints solid. Tails mourns over Fiona, crying about Robotnik creating a perfect woman, but forgetting to waterproof her. He brings her up to shore and sets her up against a rock as a monument, as he says he'll make Robotnik repair her. Robotnik laughs at him, flying away in his eggmobile. Tails begins to pick up all of the litter left on the ground by Robotnik, but discovers a list of supplies being sent to a satellite operation on the other side of Mobius. As he is about to contact Sally, he realizes doing the mission could show he is as capable as the rest of them. As he rides off, the rusted Fiona cries as her love dives off in his submarine. Continued in issue 1 of the Tails mini-series. Dulcy the Dragon is introduced. This is the first time a main character is successfully roboticized (excluding Uncle Chuck), which would later be reused as a plot device in issue 39. An attempt to roboticize Sally had already been done in the Princess Sally mini-series, albeit unsuccessfully. Robotnik's eggmobile, shown in Growing Pains, features the ball and chain attachment from Sonic 1.